We’re recruiting Part I Architectural Assistants! 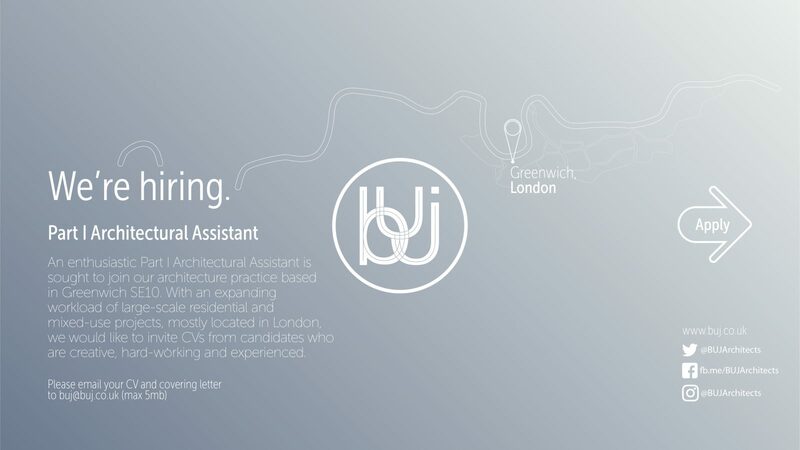 BUJ Architects are recruiting Part I Architectural Assistants for our small-medium sized office in Greenwich, London. We are seeking an enthusiastic Part I Architectural Assistant to support our expanding workload of large-scale residential and mixed-use projects, mostly located in London, and would like to invite CVs from candidates who are experienced, creative and hard-working. Proficiency in SketchUp would be advantageous. Experience in Revit would be advantageous. Experience with 3D-printing would be advantageous. Salaries dependent upon experience level. Please email your CV, covering letter and work samples to buj@buj.co.uk (max 5mb).